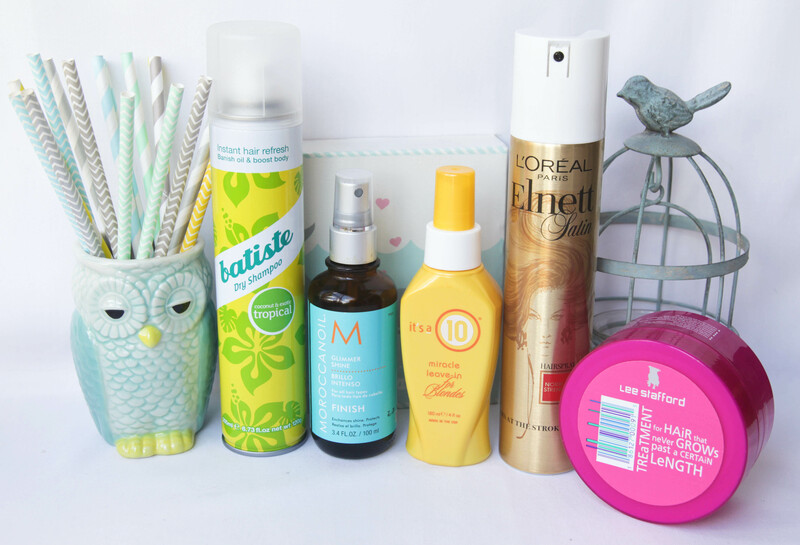 Here are my top 5 products I was obsessed with in 2013. The Dove Colour Radiance Leave-In Conditioning Spray deserves an honorable mention, because it was also a favourite of mine. To be honest, it was between Dove and It’s A 10 and I decided to award It’s A 10 with the award because it is a heat protectant too. Batiste Dry Shampoo in Tropical – I adore all the Batiste Dry Shampoos but this one’s scent just makes me want to spray it all over my body (which I don’t do, but I want to). It has the best coconut scent that lingers in your hair, so even though you might have third day hair, it removes all the oil from your roots and leaves your hair smelling like you washed it with a Piña Colada cocktail. Amazing! Retails for R 69,65 (200ml) or R 36,95 (50ml) at Clicks stores. Moroccanoil Glimmer Shine Finishing Spray – this bottle was mentioned in my ‘August 2013 Favourites’ blog post and it is THE ONLY finishing spray I use after I’ve blow dried, curled or straightened my hair. The signature Moroccanoil scent is amazing – I could be having a really bad day and just smelling this will brighten up my day. The actual spray is a fine mist that leaves your hair feeling super soft and shiny (without an oily residue), plus the scent lingers for the whole day. I will keep repurchasing this until I’m either a dead duck or until they stop producing it (which I don’t even want to consider thinking about!). Retails for R 260,00 at selected hair salons & salon supply stores. It’s A 10 Miracle Leave-In for Blondes – I am so happy I bought this bottle a couple of months ago (I’ve already gone through 1 bottle and I’m currently on my 2nd bottle). It’s a leave-in treatment for blonde girls (but there are other variations available for other hair colours and types) that nourishes the hair and slightly tones it as well. The colour of the treatment is ever so slightly purple-toned, so it definitely contains some type of toner to keep those brassy tones at bay. It also defrizzes, detangles, restores moisture, enhances shine & manageability, restores elasticity & strength, seals the hair cuticle abd protects against heat & UV rays. I’m also testing out their original ‘It’s A 10 Leave-In Treatment with Keratin’ and I’m loving it so far! These products are currently on sale on Viva Dream Cosmetics for $ 17,00 (around R 180,00) with free worldwide shipping. L’Oreal Elnett Satin Hairspray in Normal – this is also a hair styling product staple of mine and I will never use another hairspray again. It leaves your hair feeling soft and manageable (no crunchiness) and you can easily run your fingers though your hair after spraying this on your luscious locks. It also adds a beautiful shine to the hair. Retails for R 69,00 at Clicks, Dischem and the Zando online store. Lee Stafford For Hair That Never Grows Past A Certain Length Treatment – this great product was mentioned in my ‘June 2013 Favourites’ blog post because it really improved the state of my highlighted & heat-styled hair. For a short review on this hair treatment, go check out my favourites blog post linked above. I stopped using the treatment for a couple of months (no idea why, because it really worked wonders) and I could definitely see a difference in the state and texture of my hair. Needless to say, I started using it again and my hair is slowly getting back to being healthy (well, as healthy as bleached hair can be). Retails for R 70,00 at selected Clicks stores (I usually wait until Clicks have their ‘3 For 2’ promotions on Lee Stafford products to stock up). I hope you guys are having an amazing weekend! You really make me want to go out and buy all your favorite products, Luzanne. I’ll have to wait till the end of Jan to purchase some of these items (Jan is such a long month) but will defs pick some of these up. Hahahaaa! Yes, January is a difficult month for most people but try to get your hands on a few of these, you’ll love them. I’m having a blog sale at the end of January and end of February, so check that out! I used to use Lee Stafford products all the time! From what I remember the products I used smelt really good! Can’t believe i’ve never tried the Moroccan oil hair products yet! Yep, the Lee Stafford products smell like men’s cologne to me – I love it! Definitely a must-have in terms of hair products and dry shampoos make life so much easier too! This reminds me, I’m running low on my It’s A 10! Better hurry and stock up, I love it! I really enjoyed your Beauty Besties Luzanne! I will keep on purchasing It’s A 10 products until Viva Dream Cosmetics don’t ship to SA anymore (hopefully that won’t be anytime soon!). Love Elnett Satin hairspray! Great post! I’ve had my eye on the ‘Lee Stafford For Hair That Never Grows Past A Certain Length Treatment’ for so long now. I’ve read numerous reviews and all have been positive. I’m now convinced I need to buy some. This is my first time checking out your blog, I will definitely be subscribing to your YouTube channel! I’m interested in the its a 10 products. When importing, what was the total amount that you paid including the shipping & everything? & did you have to pay any duties?